Desperately searching for signs of spring? I think many of us in the Midwest are right there with you! Snowdrifts around here are so high, the streets already feel like an August corn maze in Iowa. And, another snowstorm is on the way! Our tandem kayak, Kupendana, hangs on the garage wall right above the snowblower’s winter parking spot, waiting patiently for some attention. Gene and I are more anxious, but have found the perfect treatment for our spring fever: Canoecopia, the world’s largest paddlesport expo! Need a paddle? Come find out what’s new in paddle equipment and what will work best for your paddling style. 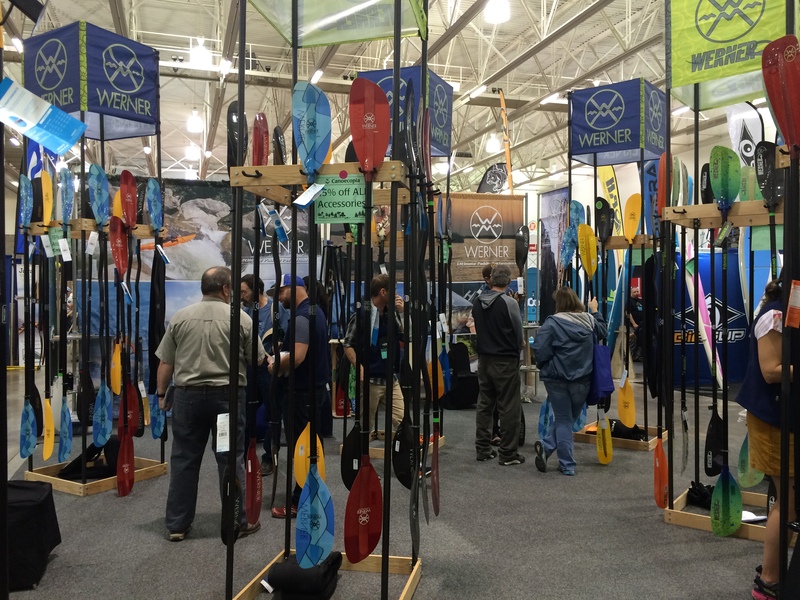 On March 8-10, paddle enthusiasts of all kinds will gather at the Alliant Energy Center in Madison, Wisconsin. Hundreds of vendors will display boats, SUPs, paddles, fishing gear, paddle clothes and supplies. Over 180 speakers are set to offer presentations on everything from beautiful paddle locales, land ethics and safety to skills such as choosing equipment, paddle techniques, packing, cooking and photography. Over at the Clarion Hotel there will even be pool demonstrations of kayak rescues, paddle strokes and Greenland Style Rolling. We discovered Canoecopia the spring before we launched on our kayak service trip in 2013. I’m not sure why we didn’t know about it before that – you’d think if the world’s largest anything were right in your backyard, you’d know about it. But a fellow paddler recommended it, so not knowing what to expect, off we went. Our first time, we made the rookie mistake of assuming we’d be able to see everything in one day. Glassy-eyed, we navigated our way through hundreds of exhibits, trying with limited success to focus on what we still needed for our upcoming trip. 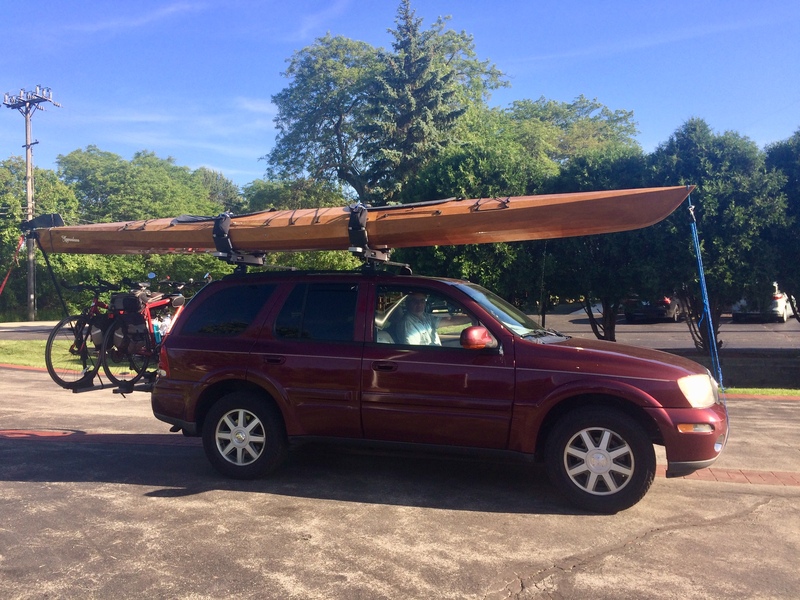 We picked up some paddle grips and splurged on a pop-up sail, but most of the time was spent learning about the newest and greatest boats, paddles, clothing and supplies, and talking to outfitters, guides, and paddlers about the experiences they could offer. We didn’t even realize how many expert presenters were scheduled throughout the three-day event to offer information about things it wouldn’t have hurt us to know. 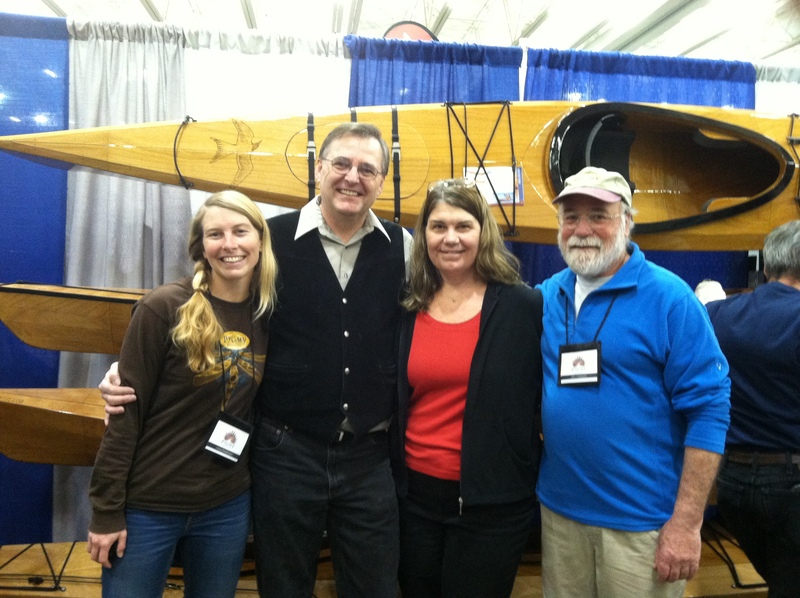 We were delighted to find that Pygmy Boats had a booth, and stopped by to meet John Lockwood, founder and owner of the company whose kit we used to build the tandem wooden kayak we planned to paddle the length of the Mississippi River. We also met adventurers who shared stories and tips from their journeys. One of the most memorable discussions was with a couple of guys who had tried three times to paddle the Mississippi, giving up each time due to “irreconcilable differences”. We laughed about it at the time, but their experiences prompted us to set some ground rules to be sure we didn’t suffer the same fate! In subsequent years, we learned to check the program or the website in advance, planning the presentations we wanted to attend and leaving plenty of time to see everything we wanted to see. We’ve gathered information on destinations that have become dreams for next adventures, listened to presenters share their stories and skills, and met authors who have written books on paddling topics. You can see the lists of this year’s presenters and exhibitors at www.canoecopia.com. I think this would look good on me. Fishing, anyone? This year, Gene and I are excited to be among the list of presenters. We’ll show some pictures of our service journey on the Mississippi and Tennessee/Tombigbee Waterway and share the process we used to dehydrate and vacuum pack one-pot nutritious meals for five months on the water. We’ll explain how we used Priority Mail to send ourselves boxes of food along the way and how we made a pot cozy to conserve cooking fuel while rehydrating meals. Our presentations will be on Friday, Mar. 8th at 6:30 PM and Saturday Mar. 9th at 9:30 AM. Please feel free to join us – we’d love to have your friendly faces in the room! I met Jim Landwehr while I was struggling through the first draft of Paddle for a Purpose, unsure if it would ever tell the story of our experience in the engaging way I hoped. Jim, also a student at AllWriters’ Workplace & Workshop, was celebrating the release of his first book, Dirty Shirt: A Boundary Waters Memoir. His topic was right up my alley – I thoroughly enjoyed his gentle story-telling voice and the intertwining of humor, insight, and heartache in the stories of his canoeing adventures with friends and family. As we both continued our writing journey, Jim has been an encourager, mentor, colleague and friend. In the next few weeks, we’ll be participating in some upcoming events together: talking about writing with students at South High School on Nov. 2, participating in author panels at the SEWI Festival of Books on Nov. 3, and doing a reading, book discussion and signing together on Dec. 13th at Subtext Books in St. Paul, MN. I had the opportunity to ask Jim some questions about his writing life. I hope you enjoy our interview! Barb: Thank you for making yourself available for this interview, Jim. Can you tell us a little about yourself and the background that led you to become a writer? Jim: Thanks so much for having me Barb. Well, I am of that strange demographic, a 56 year old male going through an existential mid-life crisis and working it out through my writing. Frankly, it’s healthier than having an affair and buying a Corvette. Besides that, it even brings in a little beer money, so that’s a win. 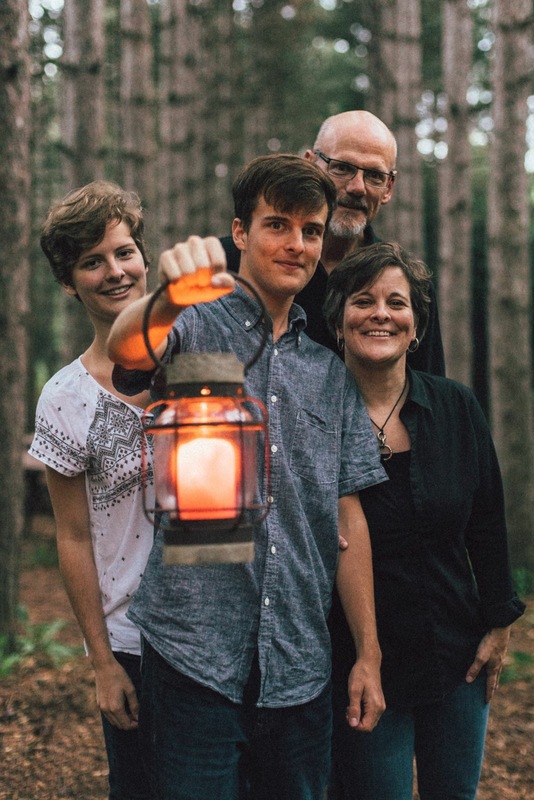 My wife Donna and I have two grown children, Sarah, a recent graduate of the University of Minnesota now living in Minneapolis and Ben, a sophomore at UW Madison. By day, I make my living as a Land Information Systems Supervisor for Waukesha County. It is a long winded title for a supervisor of a small team of mapping specialists and data geeks. 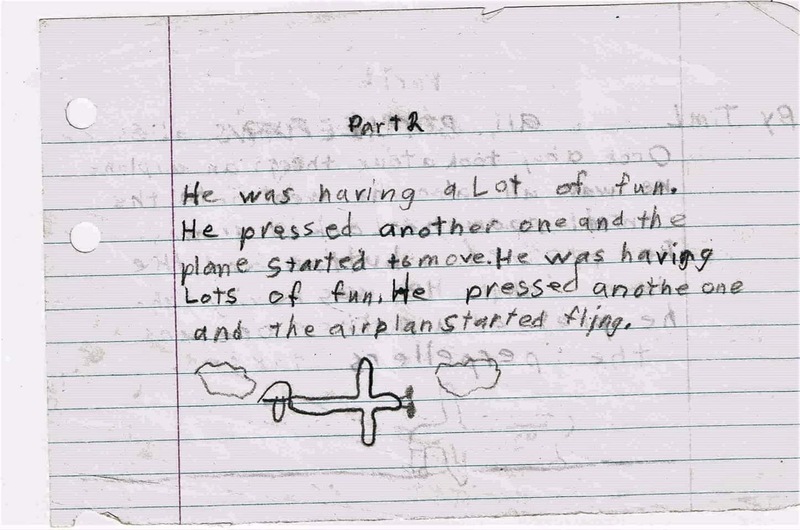 I’ve always enjoyed writing, ever since I was a kid. 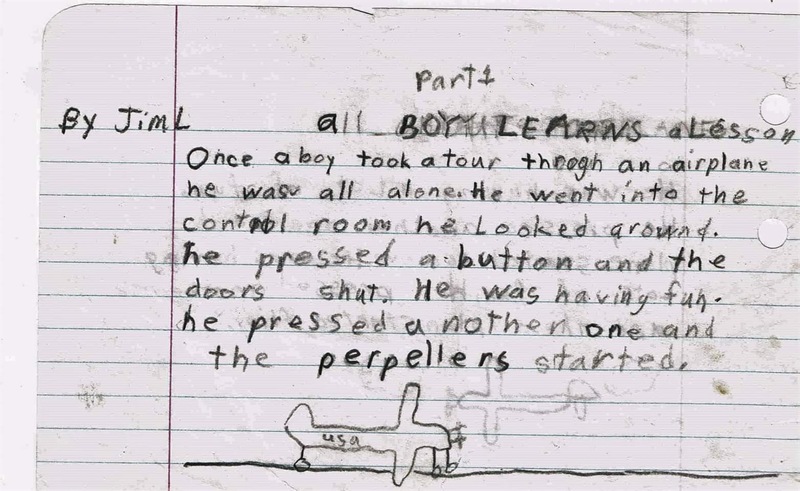 In fourth grade I used to compile short stories on half-sheets of paper. It was something that took me to the places I wrote about. I think my writing today does the same. It is total escape and I can’t imagine not doing it. Barb: You’ve posted some of the stories you wrote and illustrated as a child, which you found out that your mother saved. (I love the fact that she saved your writing, by the way!) Did you gain any insights from those glimpses into your younger self? Jim: Yes, my mother presented them to me about 15 years ago and totally caught me off guard. I remember writing them like it was yesterday. It’s funny, but all of the stories seem to have a moralistic bent to them.The stories have a solid beginning, middle and end to them, but the main characters always seem to pay the price for their errant ways. The other interesting tidbit I learned was that a few of them were outdoor adventure stories, rafting down a river, hunting, etc. It may have been foreshadowing for my first book, Dirty Shirt, which is based on adventures in the Boundary Waters Canoe Area. Barb: Two of your published books are memoirs: Dirty Shirt: A Boundary Waters Memoir and The Portland House: A ‘70s Memoir. As I read each of them, I was impressed by the detail of your memories from your youth. Do you have any strategies for taking yourself back to those moments from years ago? Jim: I often wonder how it is that I can so vividly recall certain scenes, moments and dialog from those days so long ago. I wonder if memoirists have a knack or some sort of cognitive gift for remembering things that others do not. Many of my stories have a humorous element to them, so I think that helps. People tend to remember funny and tragic stories better than the mundane. I guess I can’t pinpoint it to any one strategy as much as I just recall the story and start writing. As I move along, the details come into focus and I try and bring the reader back to that place and time. Barb: You’ve published three poetry collections: Reciting from Memory, Written Life, and most recently, On a Road. What led you to cross over genres from memoir to poetry? Do these two genres compete for your attention, or complement one another? Jim: When I enrolled in AllWriters’ Workshop and Workplace there were a couple of poets in the group. I was intrigued by their work and the craft in general. In an attempt to stretch myself, I started writing a few. I thought they were awful, but when I brought them into class, people really responded positively to them. It was encouraging, so I kept at it. Then, I had a short 20 line poem accepted as my first “published piece.” I was ecstatic! It fueled my desire for getting my work published and I haven’t looked back. But, to the question, I feel the two genres complement each other nicely. After all, a poem is just a really, really short story. You’re forced to use an economy of words to get a descriptive, succinct message across. My instructor, Michael Giorgio put it best when he said, writing poetry makes you a better writer. I think that holds true regardless of genre. Barb: You write often about your parents and siblings, especially in your most recent memoir, The Portland House. Tell us a little about your childhood family. What elements of your Portland House family’s characteristics have you sought to preserve? 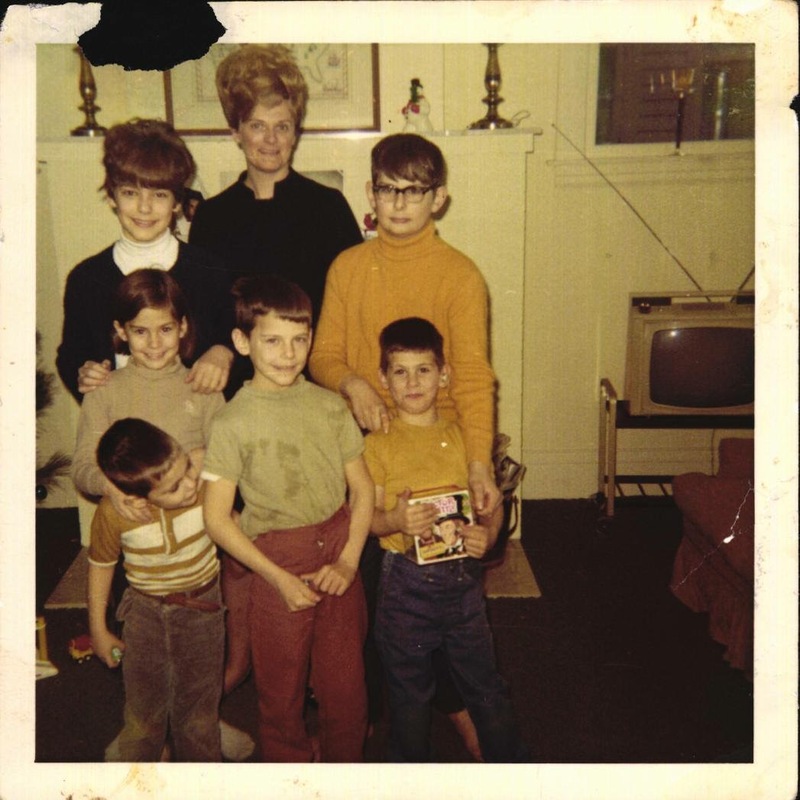 Jim: I grew up in a big, single-parent family (7 kids) in the ‘70s. This made for a ton of funny stories as well as some heart touching moments. But it was an environment radically different from my current family of a wife and two kids. My mother always taught us to respect our elders and one another and that is something I’ve always emphasized with my kids. I think it worked out because I have good kids. Another thing I remember from my days as a boy, Mom always valued having dinner as a family around the table at least four or five nights a week. My wife and I made it a priority to do that same thing as a family. It is where we debrief from our day and laugh with one another. Even better, it almost always started with a prayer of thanksgiving. Barb: What propels you to share the stories of your experiences through memoir and poetry? Jim: When I first started writing my stories of the Boundary Waters, my intent was just to get stories down for my family – for posterity. As the stories accumulated, my writing instructor, Kathie Giorgio asked if I’d ever thought about putting them into a book, a memoir. I said, no I hadn’t. She said “Well, I think you should.” Two hundred and forty pages later, I had a Dirty Shirt. But to be truthful, I think my stories of family and friends ring true for a lot of people. They can relate to sibling interactions, struggles in school, kid mischief and the like. These stories are timeless. My goal is to make them entertaining by adding humor and heart where applicable. Barb: How do you find time to write? Do you write on a specific schedule? Jim: I work a 40 hour a week job, so I have to make time to write. I try and do a little on weeknights, but usually my brain is a little fried by that time of day. One thing I do practice with regularity is a two hour bank of time on Saturdays. I call this my “anchor time” a term I got from another writer. If I carve out this time and keep it sacred, I can get a fair amount done. Then, if my weeknight writing doesn’t go well, at least I had my anchor time to show for the week. My wife has always been very supportive of my need for that time. Sometimes it even comes at the expense of household projects, but I do what I can in both arenas. Barb: How do you feel about interactions with your readers? Do any special anecdotes come to mind? Jim: It is the single most rewarding part of the process, getting feedback. It makes me happier than the money aspect for sure. Having someone say that they laughed or cried during the reading of my work, well, that’s what it’s all about isn’t it? To evoke an emotional response from your audience. I recall one review that said the reader laughed and cried, sometimes on the same page. But to be honest, the one or two bad reviews I’ve received stay with me as much as the good ones. Writers tend to be critical of themselves as it is. To have someone validate that criticism hurts, but it’s all part of the game, I guess. Barb: Can you tell us about your new release, and what you’re working on next? Jim: My latest poetry chapbook, On a Road, came out on 10/21/2018. It is a series of poems written about a road trip I took to California from Minnesota with two friends in a rental car in 1984. Because the trip had elements of Kerouac’s classic On the Road, I wanted it to stylistically echo his work. It is different from and edgier than anything I’ve ever written before, so I’m not sure how people will perceive it. It was one of those things that was just in me and had to come out. I liken it to my Beatles “Lonely Hearts Club Band” album. A little out there. But therein lies the beauty of writing. The boundaries are loose and you go with your heart, right? I am currently working on another memoir about my high school experience. I attended an all-male, Catholic, military school which in and of itself is unique enough to warrant a book. It is not just about the school however, it is about growing up and moving from boy to man and all the risk and reward that comes with that passage. Of course I have two or three other ideas for projects, but I am trying to stay focused and finish one thing at a time. I might add that my only regret about my writing is that I got started so late (in my late forties). So, I’m writing like a maniac in an attempt to make up for it. Thankfully, I am having some success along the way. The whole deal is hard work, but a whole lot of fun. Barb: Thank you, Jim, for giving us a glimpse into your writing life! Please leave us with your website address, upcoming events, and any social media accounts that our readers could use to follow you if they’re interested in learning more. Jim: Thank you again for hosting me Barb. I am grateful to be appearing along with you and many other colleagues and friends at the Southeastern Wisconsin Festival of Books on November 3rd. I wish you continued success with all of your writing pursuits. Click on the picture to learn more about Jim’s books. 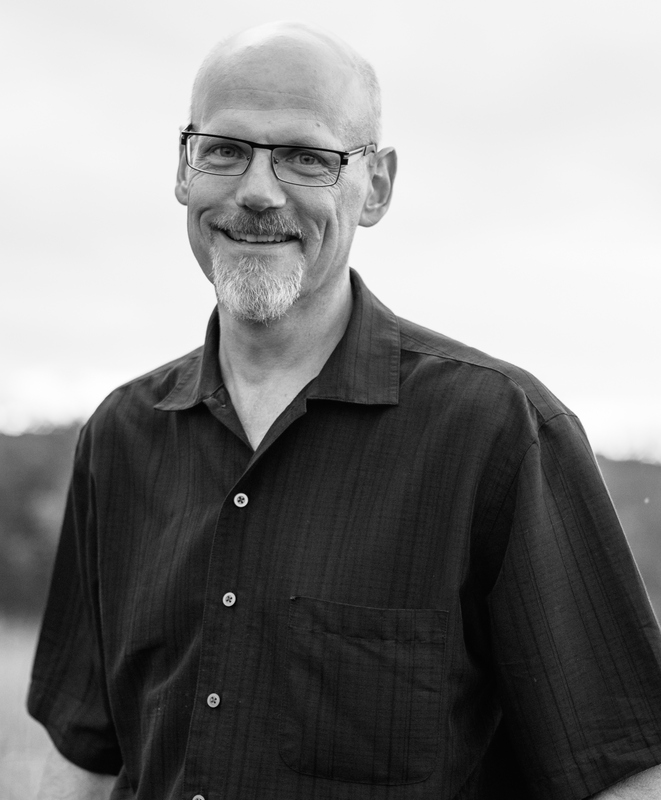 Jim Landwehr has two poetry collections, Reciting from Memory, and Written Life. He has a forthcoming chapbook On a Road. Jim also has two nonfiction books, Dirty Shirt: A Boundary Waters Memoir and The Portland House: A ’70s Memoir. 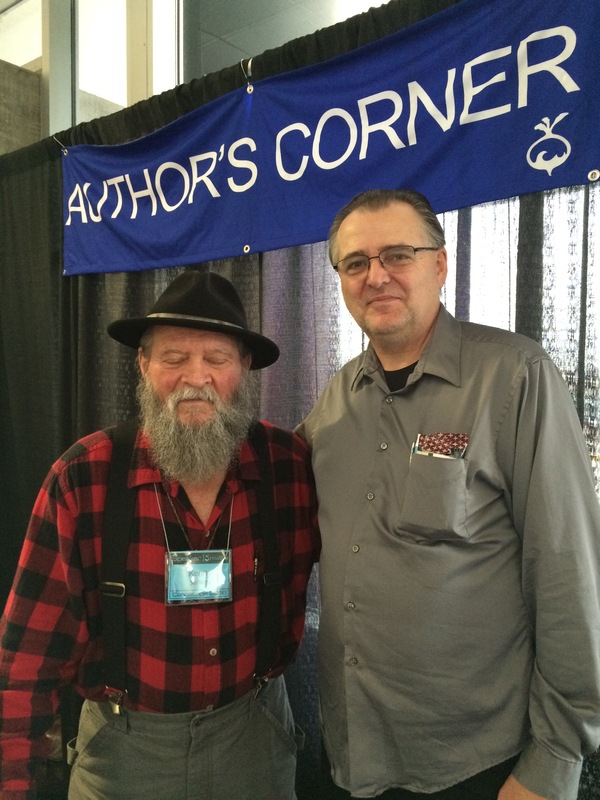 His non-fiction stories have been published in Main Street Rag, Prairie Rose Publications, Steam Ticket and others. His poetry has been featured in Torrid Literature Journal, Portage Magazine, Blue Heron Review and many others. He enjoys fishing, kayaking, biking and camping. Jim is poet laureate for the Village of Wales, Wisconsin. Paddling the Mississippi River, one of our greatest joys was spotting the white heads and tails of bald eagles amidst the foliage, then watching as they launched from the trees to soar majestically through the sky, escorting us down the river corridor. So, you can imagine my delight when my friend, Mary Ann, told me that her husband helped to band and track bald eagles during the years when they were listed as an endangered species in many states. In fact, Chuck Sindelar was recognized by the Wisconsin DNR as a “Comeback Champion” for his efforts to help monitor the state’s bald eagle population during this troubling time. History is filled with stories of comebacks – brilliant returns from all kinds of adversity. Each story is inspiring in its own way and holds the capacity to teach us about perspective, creativity, optimism, hope and perseverance. But, one particular story has touched generations of Americans – that of our esteemed national symbol, the American Bald Eagle. In the early years of our country, bald eagles were plentiful. Adopted by Congress in 1782 as our national bird, the bald eagle represented majesty, strength and freedom. As the human population grew and moved westward, however, the eagle population began to decline. 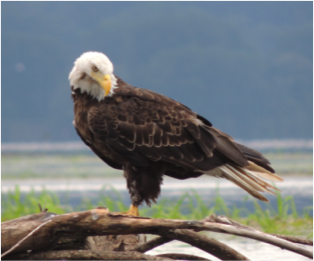 Building, logging, and farming encroached on their natural habitat and eagles were often shot as potential threats to livestock and as hunting and fishing competitors. The Bald Eagle Protection Act of 1940 made it illegal to kill eagles, disturb their nesting sites, or possess eagle feathers, eggs, or parts. Widespread use of a newly developed insecticide called DDT, however, caused toxicity problems with eagle egg development. The bald eagle population declined to only 417 nesting pairs by 1963. Last month, Gene and I had the chance to meet Chuck and to talk with him about his work with eagles. Mary Ann welcomed me with a warm hug, then did the same to Gene. “Thank you for coming,” she said. Chuck, comfortably dressed in a white shirt tucked into blue jeans, shook hands and led us into their ranch home. Photos and collections lined the walls and filled the counters, bearing witness to the varied interests of this couple during more than fifty years of life together. Chuck placed a stack of topographical county maps on the coffee table, spreading one out flat for us to see. 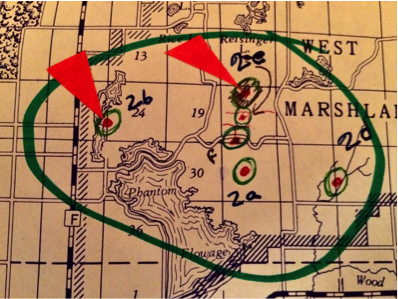 Color-coded circles surrounded dots, representing nests, scattered around Marien County. “How did you find all the nests?” I asked. “She also helped type my reports,” added Chuck. “I couldn’t have done it without her. But I call her my first wife so she won’t get too comfortable.” He smiled at what I figured was an ongoing joke between the two of them. 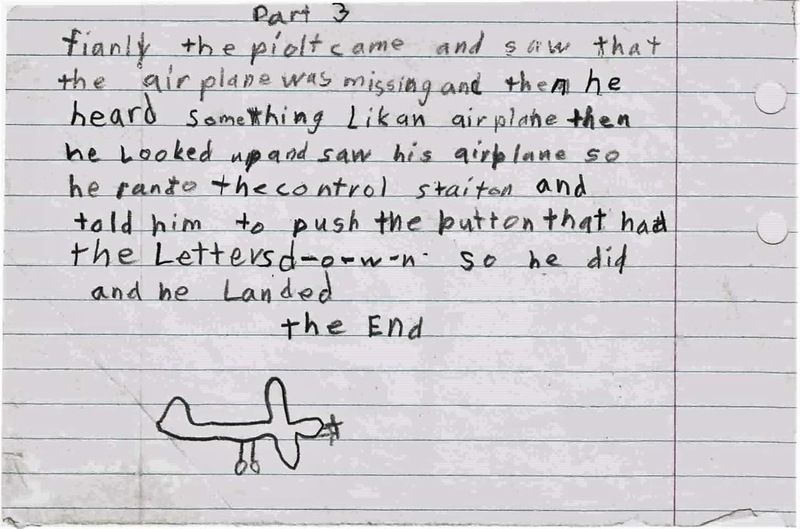 “What kind of plane did you use?” asked Gene. I could always count on him to show interest in technical matters. “What if the parents were in the nest?” I asked. 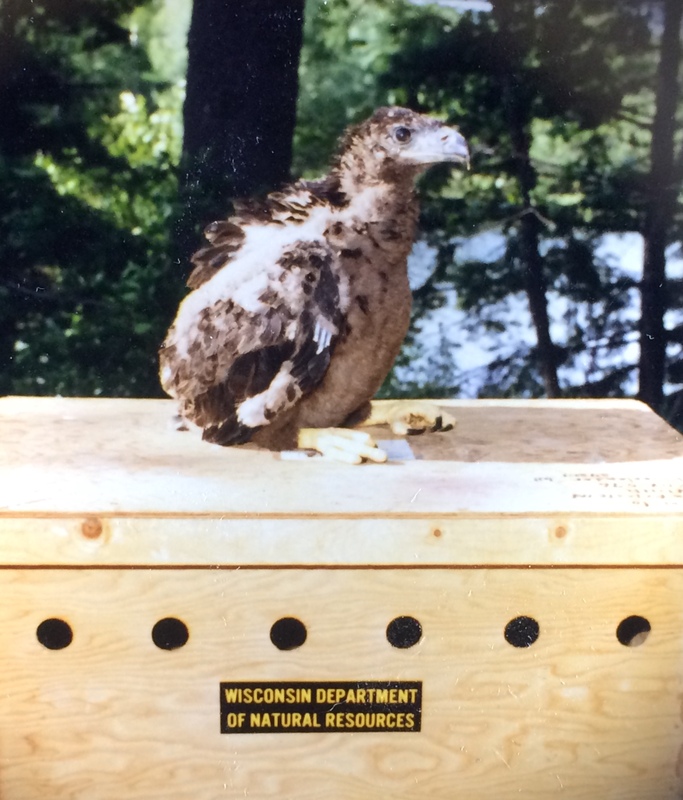 Some eaglets were sent from Wisconsin to help populate other states. Chuck found it satisfying to see the increase in breeding pairs and see how far his birds traveled. “Take a look at this,” he said, placing a small map in front of me. Lines originating in Wisconsin radiated out in all directions to locations around the country. 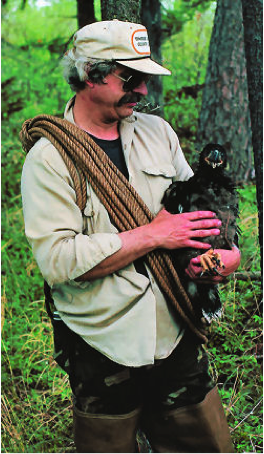 “When people find banded birds,” he explained, “they report it and I get an email that tells me who found it and where. I keep a record of each one.” A lot of them are in Wisconsin, but this map shows the ones that traveled farther.” I noticed that the lines on the map reached as far south as Texas and Florida and as far west as Idaho. Chuck stopped banding in 1989 when the state took over the program. in 1995, the bald eagle was removed from the Endangered Species lists and in 2007, was removed from Threatened Species lists in all states. “I read that as of 2014, there were over 10,000 nesting pairs,” I announced. “They think there are a lot more now,” he said. “More like 18,000 pairs, I think. But they don’t study it anymore, so there’s really no way of knowing. It’s just a guess.” Just the fact that the eagles are secure enough not to need continued monitoring felt, to me, like a huge win. “Thank you for spending time with us,” I said to Chuck, as we prepared to leave. “And for all you’ve done. You have such wonderful stories.” Another hug for Mary Ann, and we turned to leave. In what seemed like no time, two hours had passed, listening to the stories of this man – a central figure in one of the most significant wildlife recoveries of my lifetime. 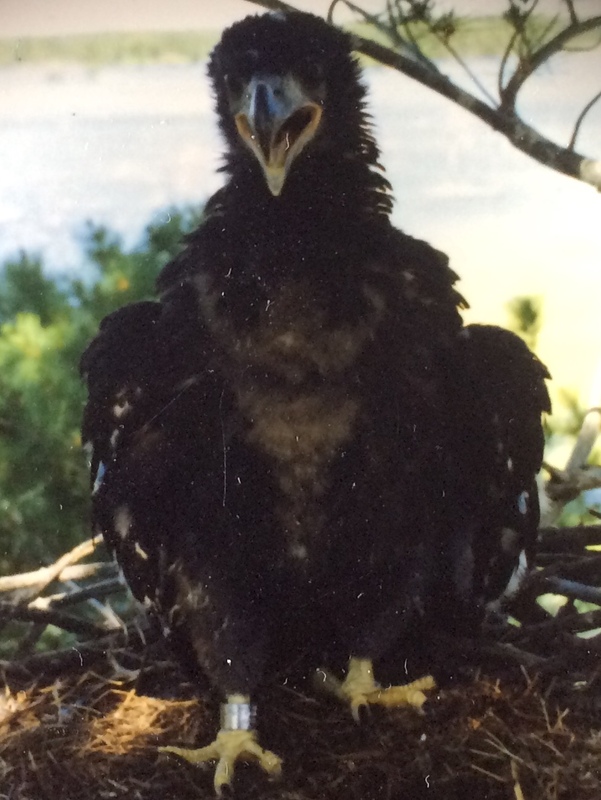 A man who loved eagles enough to sacrifice time with his family and financial reward to help increase our understanding of them and to identify, document and protect their nests and young. I will be forever grateful. This September, we spent time in one of our many favorite areas of the Mississippi River, La Crosse, WI. Upon our arrival, the very first thing we did was (You guessed it!) take Kupendana for a paddle. With no responsibility to keep track of mileage or to take pictures, it was a delightful dip into nature’s pool. We saw cormorants, ducks, herons and a bald eagle who majestically surveyed it all from its lofty perch – not at all intimidated by our intrusion. We stopped near a sand beach to chat with other kayakers, sharing an easy camaraderie and remembering all the things we loved about this amazing section of the mighty river. Nick Radner, Director of Development, and Jim Petersen, Director of Planned Giving, take time from their meeting to welcome us. 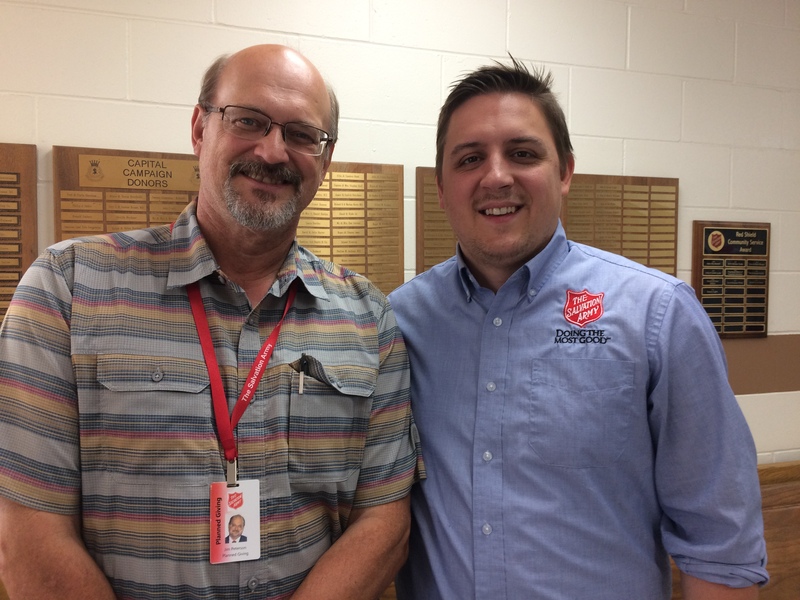 We visited the Salvation Army and found that, while some of the names and positions changed, the organization and the people we met were as strong and compassionate as we remembered, offering help in so many ways to the residents of La Crosse County. While Nick, the Director of Development, was busy with meetings, Kelley helped facilitate an interview with Channel 8 news, for a short segment about our book and a signing later that evening at the Valley View Barnes & Noble. Dan, Mike, and Nate take time for a picture and a chat after the lunch rush. Later, we sliced potatoes to help prepare the evening meal while a group of volunteers from the community served lunch. Dan, now retired and two architectural firm employees, Mike and Nate, made up the Friday lunch team. “They call us the A Team,” Mike said, “but I suspect they say that to all the teams.” Ranging from two to six years of experience, I had no doubt this lunch crew was an experienced and dedicated bunch. Gene thanks Doug, Kitchen Manager at the Salvation Army, for having us (again). Doug, the Kitchen Supervisor, zipped about, but took time to answer our questions and tell us more about the food program. 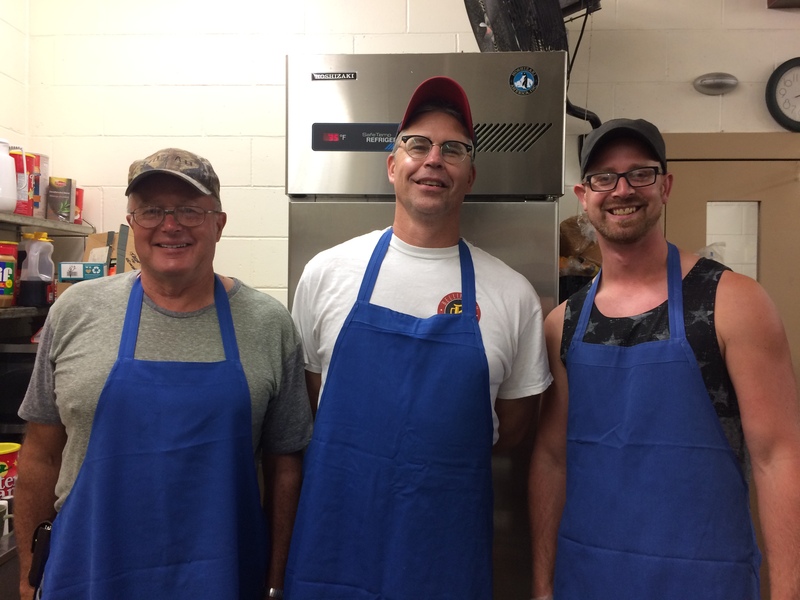 “We have plenty of volunteers,” he said, “but right now, we’re looking for a full-time weekend cook to supervise the food program on Saturdays, Sundays and Mondays. The position comes with benefits, but it’s hard to find someone who has weekends free to work.” If you live in the La Crosse area and would like to know more about this open position, please email Doug, Kitchen Supervisor, or Abbey, Director of Operations. Our next visit was Myrick Park, where we spent time during our trip at the Myrick-Hixon Eco Center. Unfortunately, we learned that the Eco Center is no longer operational and several elements of the park have been removed. Water no longer tumbles down the hillside, and the Forest Scramble playground has been relocated to a Boy Scout camp nearby. But, the beautiful prairie plantings have been expanded and still line the long walkway that we weeded during the day we spent with them years ago! Many of the plantings are maintained by the Buff County Master Gardeners, and were spectacularly decked out in fall color. 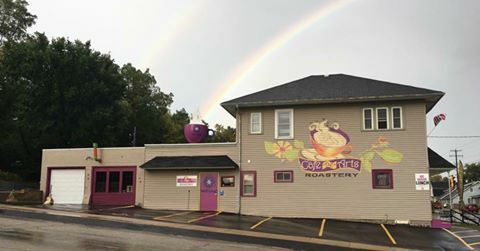 The building is now leased by WisCorps, a 501(c)(3) conservation corps dedicated to “engaging youth and young adults” in three different areas. 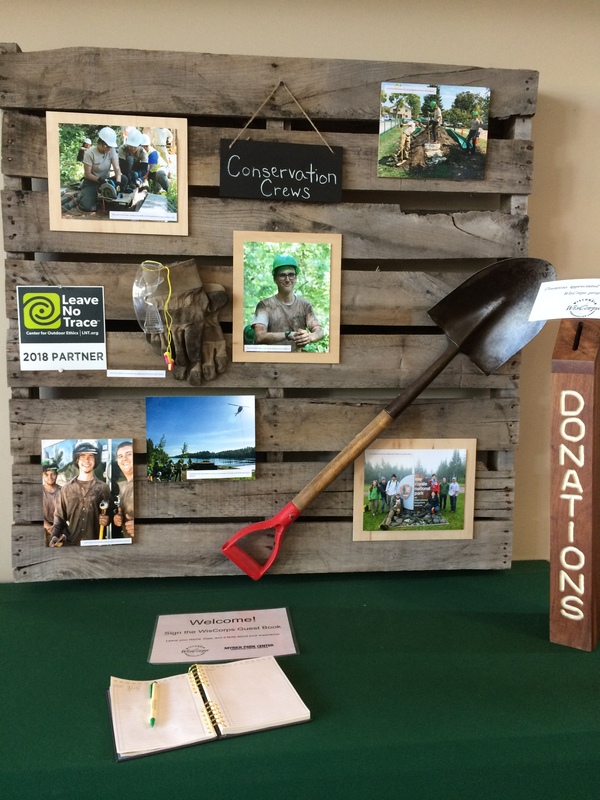 Crews of 4-6 young adults, age 16-25, complete conservation projects throughout Wisconsin and the Upper Midwest. They are supervised by experienced leaders and are paid for their work. As they construct trails, manage invasive species, build retaining walls, bridges and boardwalks, stabilize prairies, restore stream banks and clean up storm damage, the youth gain skills and knowledge about and appreciation for our natural resources. A second employment opportunity is through WisCorps WORKS. Students gain longer-term work experience and classroom training which prepare them for the world of work. 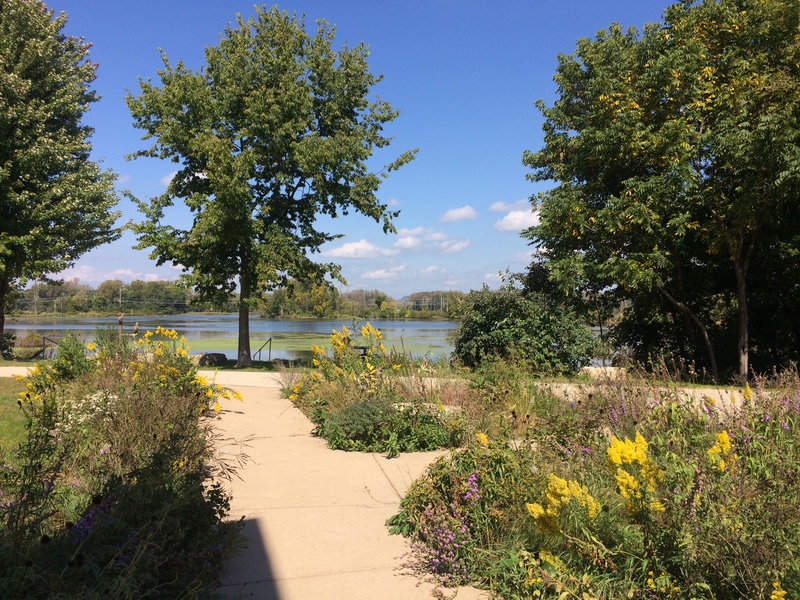 The third component of WisCorps is one in which the Eco Center was also highly engaged – providing nature education programs. Stephanie, the Education Manager and the only employee still there from the Eco Center days, told us, ” We’re still here, doing a similar mission.” Just finishing up a teacher training, Stephanie introduced us to two student assistants, as they cleaned up the room lined with aquarium habitats for live fish, snakes and turtles. 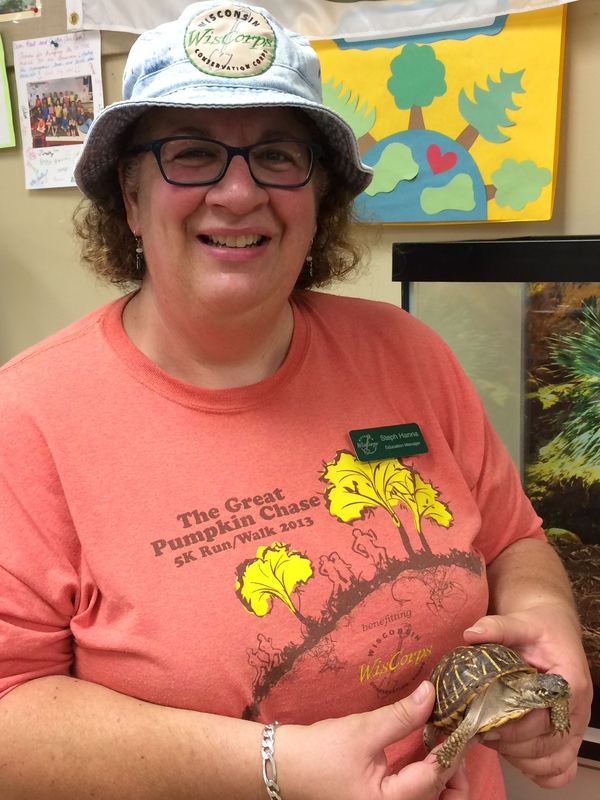 Holding Foxy, the Ornate Box Turtle gently, she told us about fostering appreciation and stewardship for our environment through school and public programs, day camps, playgroups, and even a “critter-mobile”, which brings interesting animals out into the community. 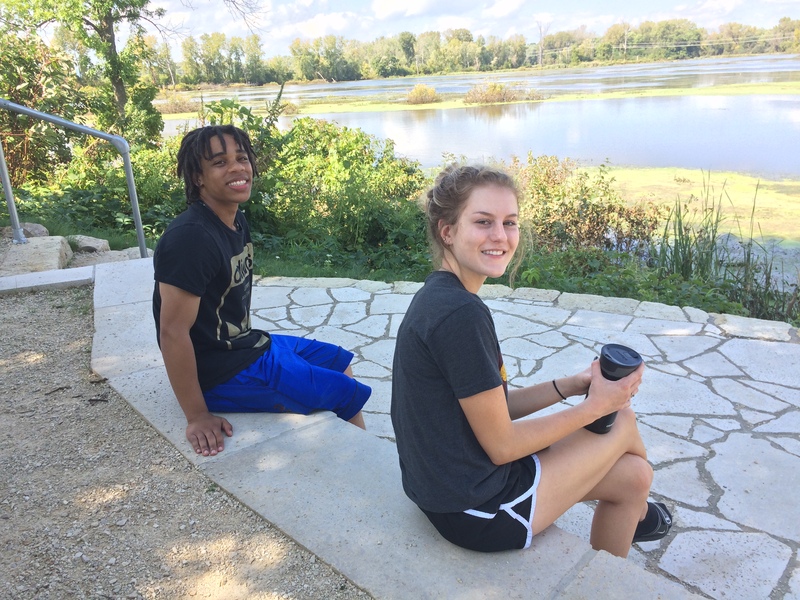 Before we left, we walked outside to the new semi-circular seating area with stepped concrete benches overlooking the lake. Two students from UW-La Crosse, David and Rachel, joined us for a study break. Together we watched bicyclists pedal along the paths around the lake and caught glimpses of ducks, muskrats, and sunning turtles. Even though the place we loved has changed, it is still a gem in the community and a lovely place to learn, relax, and enjoy the outdoors. 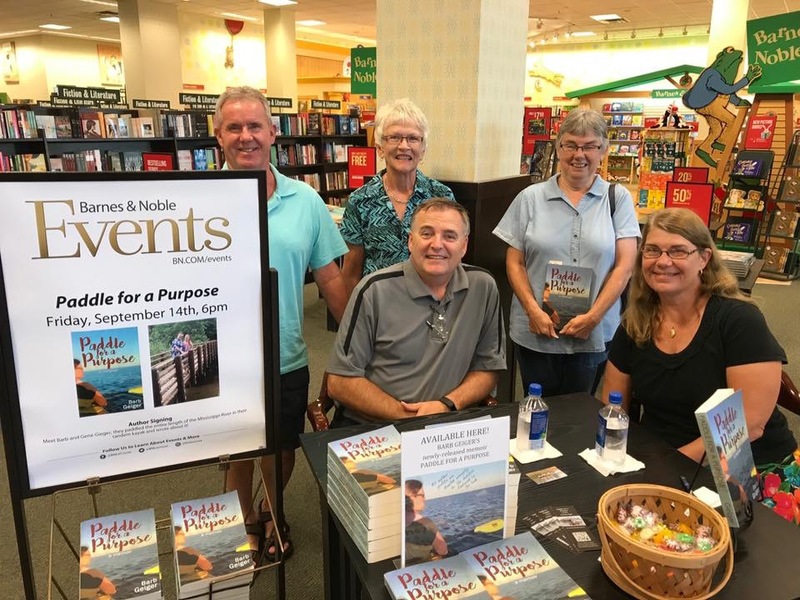 After a quick dinner and change of clothes, off we went to the Valley View Mall, where Barnes & Noble graciously hosted us for a Book Signing from 6-8. No lines around the block, folks. But, we did have some great conversations with readers and shoppers, telling the story of our trip, handing out bookmarks with our website address, and selling and signing a few books as well. 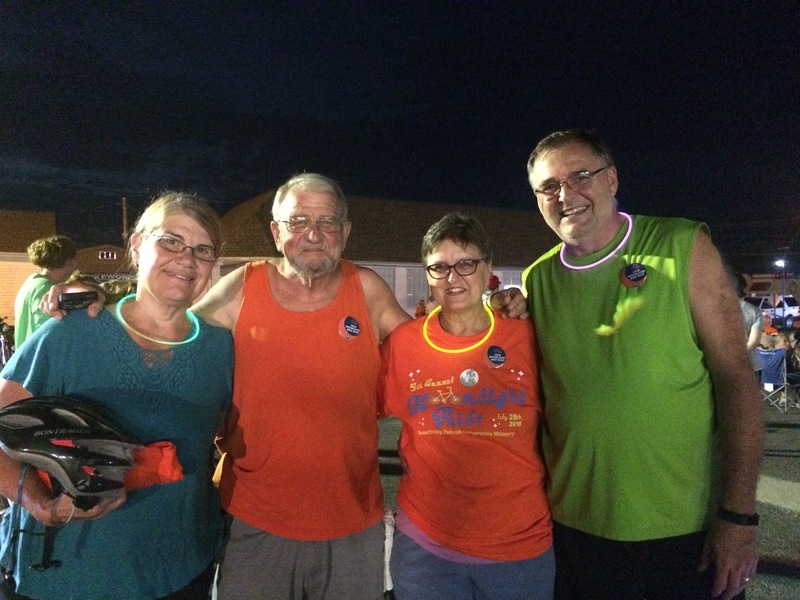 Our friends from Waukesha, Terry and Donna even brought Donna’s brother, Bob and his wife, Liz to see us. Thank you, Barnes & Noble, for making us feel special with your advertising and your incredible hospitality. We signed some books to leave in the store, so if any of you are in the La Crosse area and don’t have yours yet, or want to pick one up for a gift for an adventurer you know, stop out at the Valley View Mall! If you’ve read Paddle for a Purpose, you know we stayed with Terry and Donna at their retirement home on the family farmstead during our paddle. Well, it made sense to them to have us back during our book trip to La Crosse. Who were we to argue with that? We enjoyed the beautiful country, the small town De Soto life, and rides along the river. Reminiscing about the tractor pull we attended our last time in the area, I mentioned that, although I grew up in Wisconsin, I never rode a tractor. 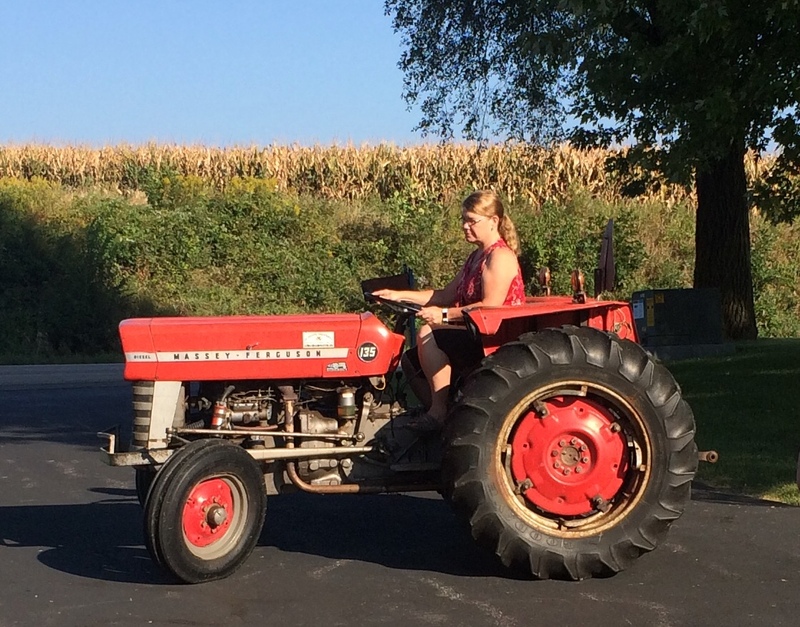 I was hoping Terry would give me a ride, but instead, he taught me how to drive his antique Massey-Ferguson all by myself! We finished our Wisconsin Mississippi visit by visiting a craft fair in Ferryville and watching Harness Races and a Demolition Derby at the Vernon County Fair. Thanks, Terry and Donna, for another wonderful visit! Our last book trip along the river will be the Twin Cities in December. We’ll be appearing at Subtext Books in St. Paul, with one of my favorite authors, Jim Landwehr, doing a joint book reading and conversation. Jim is the author of two memoirs (Dirty Shirt: A Boundary Waters Memoir and The Portland House: a 70’s Memoir) and two books of poetry (Written Life and Reciting From Memory), with more coming out soon. I’m honored to be appearing with him. If you’re interested in what else we’re up to, check out the Appearances tab on our main page. We wish you a blessed fall. Southern hospitality. We felt it on our paddle through this area of our country, and again during our most recent gratitude tour. 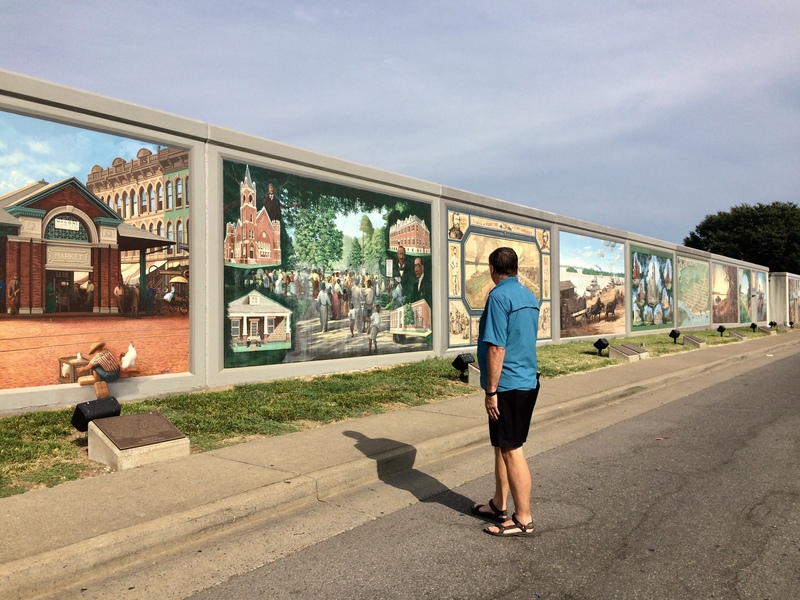 Our first stop was Paducah, KY, where we volunteered with Paducah Cooperative Ministries, an organization formed through the cooperation of area churches. 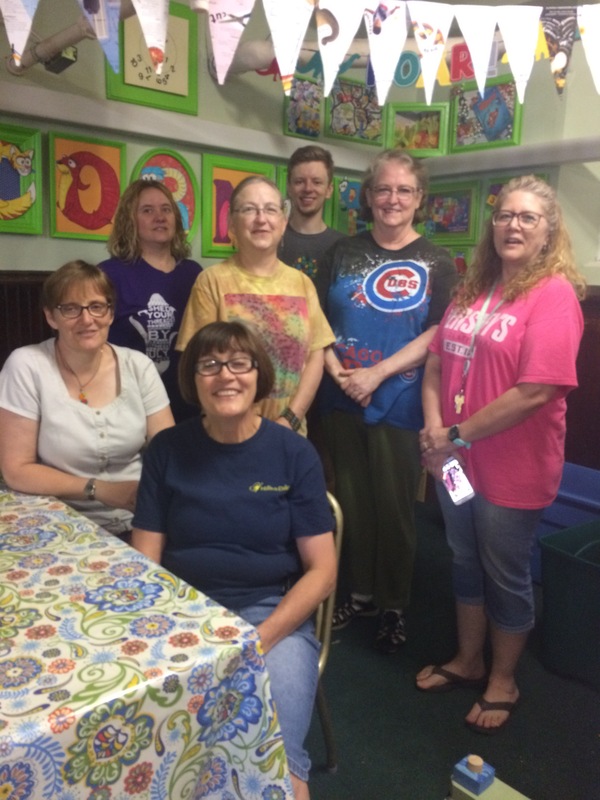 PCM “seeks to do God’s work with human hands by bringing together individuals and resources to respond to basic human needs and conditions in McCracken County.” You can find out more about them here. PCM’s Moonlight Ride fundraiser was the reason we planned our southern trip for the dates we did. In fact, we found out later that these Wisconsinites were the first two riders to register in the event! We weren’t about to miss this! Two of our River Angels, Kenneth and his wife, Lottie, decided to register and ride with us – but they didn’t have bikes. So, Kenneth bought one and Lottie rented one for the day! 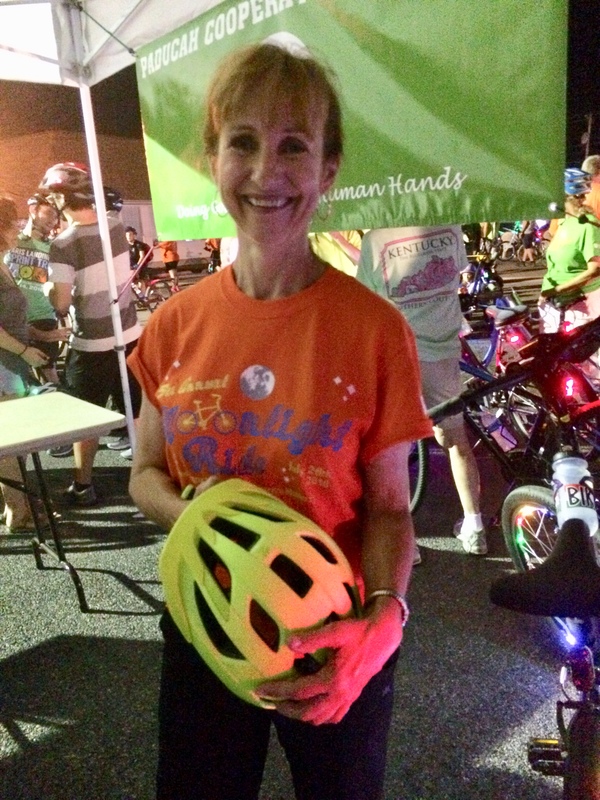 648 riders set off at 10 PM under a nearly full moon, bicycles decked out in colorful lights. Our dollar store light sticks were no match for the new-fangled LED strings of bicycle wheel lights adorning many of the local two-wheelers. We weren’t in a hurry, but we probably packed more conversation into ten miles than any of the rest! We arrived home a week later to several packages from Kenneth – new flashing tail lights, flashlights and handlebar mounts, and four sets of multicolored bike wheel lights. I bet Kenneth and Lottie might be the first two registered for next year’s ride! While in Paducah, we also made a stop at Hooper’s, a downtown sporting goods store, to thank them for storing Donna while we were in town. 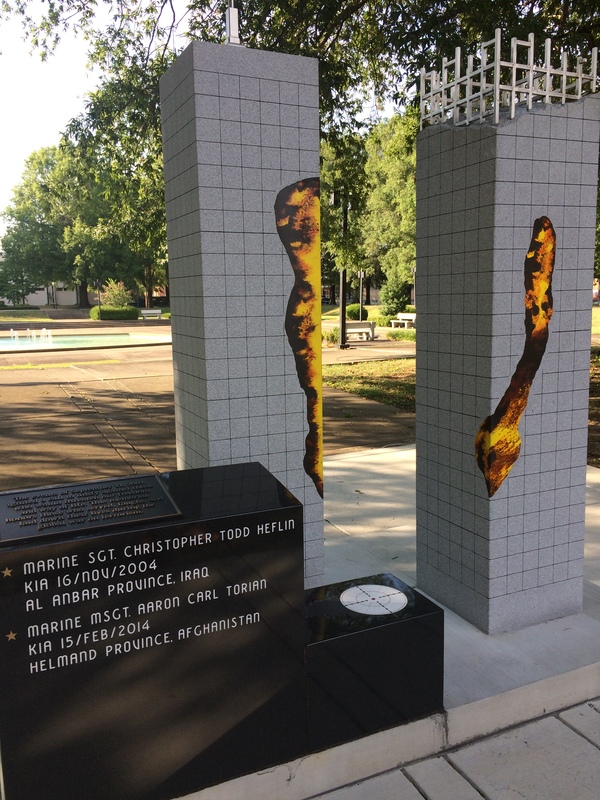 We checked out a new tribute to those who have lost lives to terrorism, and of course, visited the river. A special thank you to Chris for hosting us for a signing at Paducah Books. We enjoyed meeting his customers, signing a few books, and finding several titles that we couldn’t resist buying for ourselves. 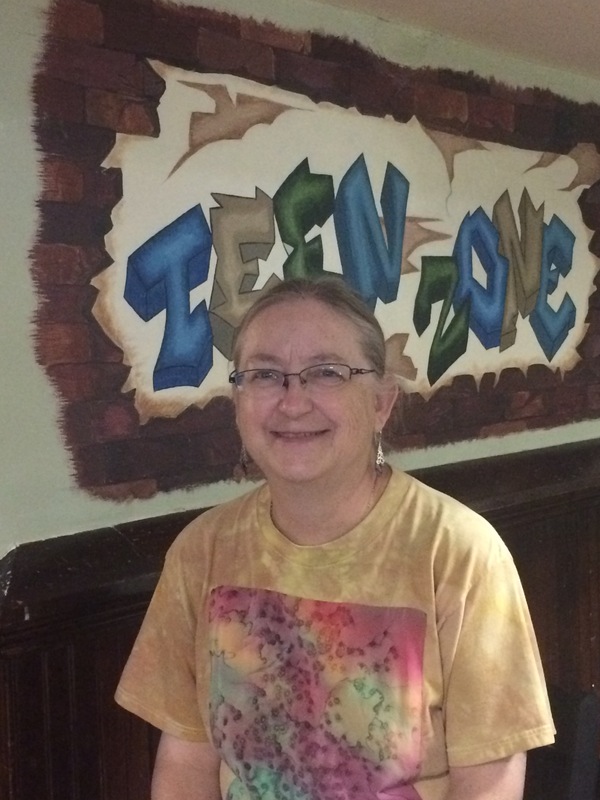 In Fulton, MS, our first destination was the Itawamba Learning Center to visit with Elizabeth Triplett, founder and tutor. We learned the organization is continuing to thrive and to change lives through education. Greg, a new member of the team, has helped enormously by taking on the role of grant writer, increasing both their financial resources and their impact. Our reading and signing took place at the Itawamba County Pratt Memorial Library, where we were welcomed by the librarian, Jeffrey, when we stopped in early. He was holding a summer class on robotics, where we met some brilliant young programmers. At the reading later that day, we renewed friendships with members of the Learning Center staff we met on our trip as well as new additions to the team. 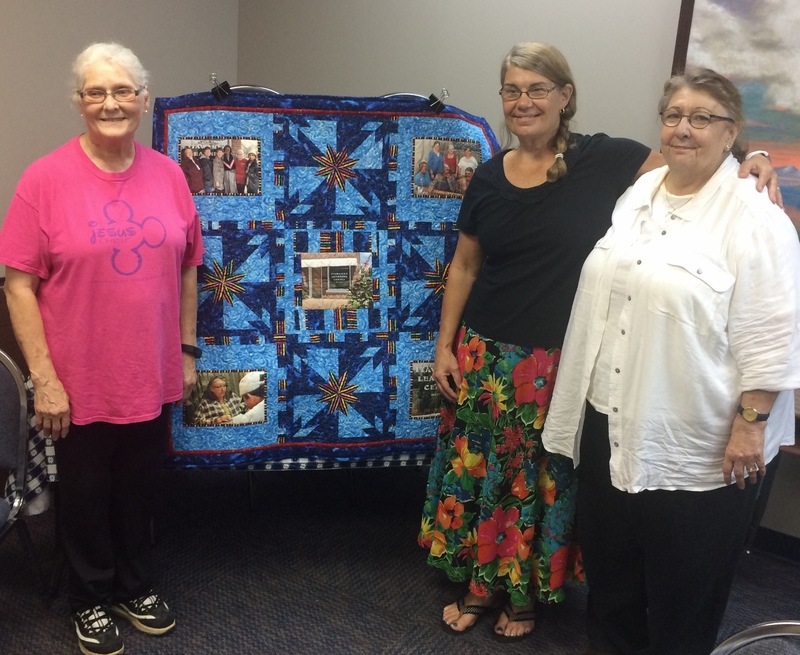 We congratulated Gwen, a student who went on to graduate from the area college, and met her mother, whose picture is with Gwen’s on the quilt Judy made for us. The Blake family River Angels, who hosted us at their home during our trip, even trusted me to read their section aloud before they had yet seen it. I laughed to discover that Alan actually HAD been watching when we got hung up on a stump upon leaving after our stay there! On our way out of town, we stopped at the Itawamba Times to say “Hi” and “Thank you” to Adam, Times reporter and photographer, for his excellent media coverage of both our visits and the Itawamba Learning Center’s work. We had no book events in TN, but stopped at the Tennessee River Museum in Savannah to thank Vicki for her assistance with logistics, and Kent, for storing Donna for us while we were in town. We also drove (this time) to the office of Dr. Gallien, the kind dentist who found me great relief from a toothache during our trip. Aware that we were taking up his time during his work day, I hastened to shorten our visit, when he comforted, “Right now, you’re the only thing that’s important to me.” What an example of courtesy that seems endangered today – focusing entirely on those with whom we are having conversation. I asked him about his goal of working fifty years before he retires. “I’ve changed my mind about that,” he confessed. “I’m planning on working ’til my toes point up.” A smile on his face, he held his hands out with his fingers bent upward. If that’s so, his patients are the lucky ones. 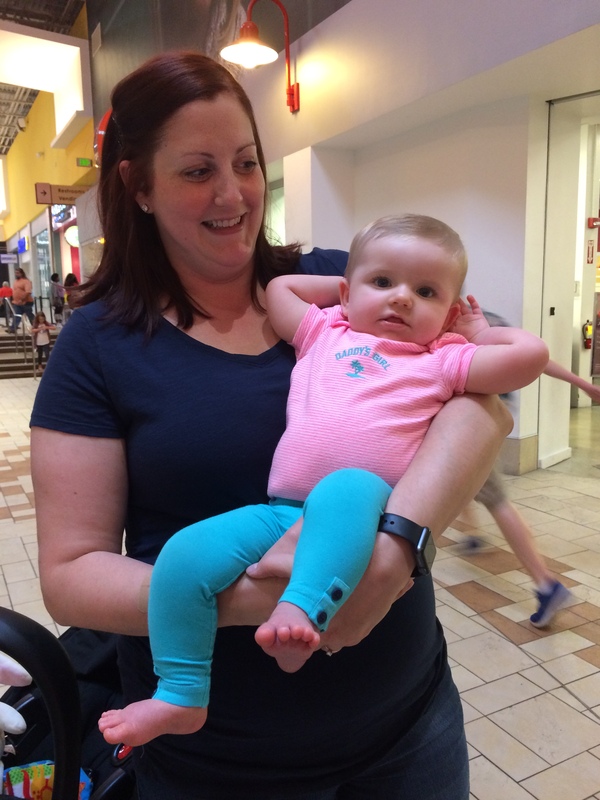 Cassie glanced at her husband, Adam, and hugged her 7 month-old daughter, Ellie. “Yes,” she said. “I’m so happy.” Gene beamed, too – happy for her. We’re back in WI for August. It’s nice to be home for awhile. Lest you think that the author life is all glamping and travel, our August calendar is filled with meetings, work, cataract surgeries for Gene, and unanticipated kitchen remodeling due to an unfortunate dishwasher flooding incident. Yep – we’re just everyday folks! Our first Book Trip ended up being filled with wonderful experiences – better than we ever expected. And, it had very little to do with selling books. Once again, it was about the people that we met, and those with whom we reconnected. 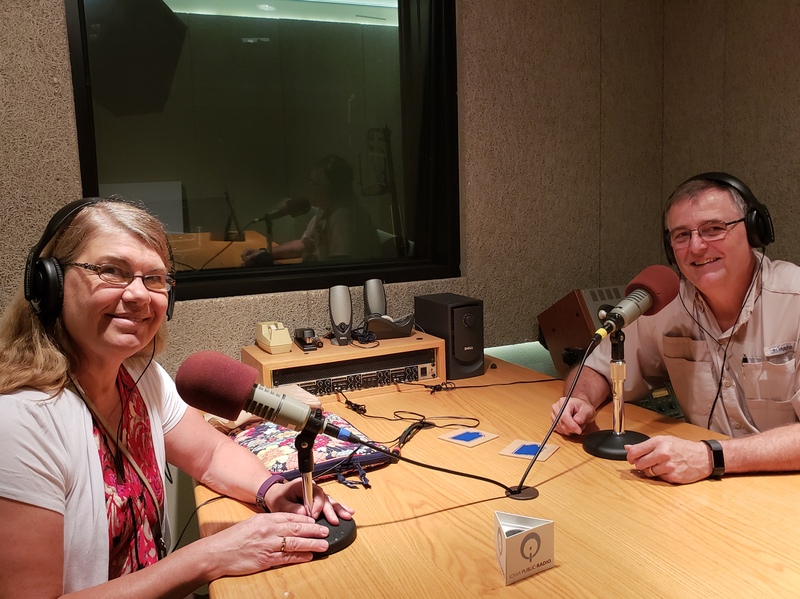 Sure, Gene and I got to be on the radio for the first time ever: Iowa Public Radio’s program, Talk of Iowa, with Charity Nebbe. With her bubbly personality and excellent interview skills, she calmed our newbie jitters in no time. I almost forgot other people might be listening. Well, except for the cool headphones, the microphones and the brightly-lit “On Air” sign. 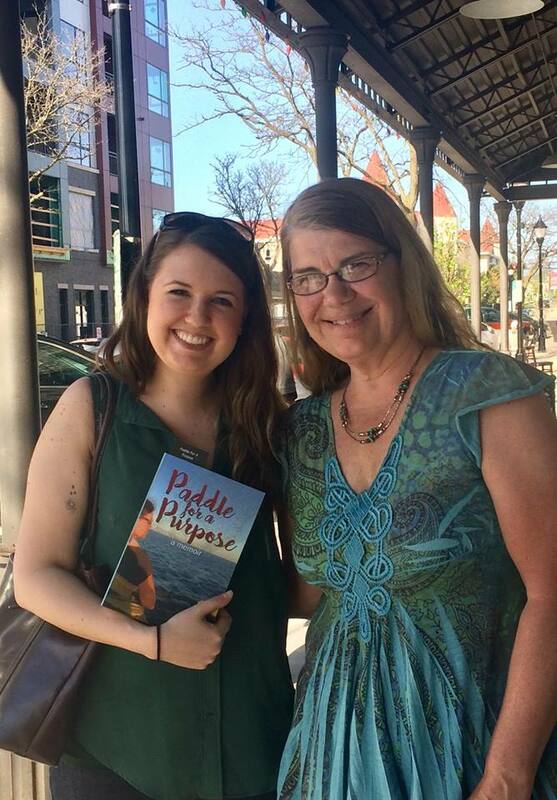 Sue Davis, owner of River Lights Bookstore, welcomed us warmly and found a spot for Paddle for a Purpose on her shelf! 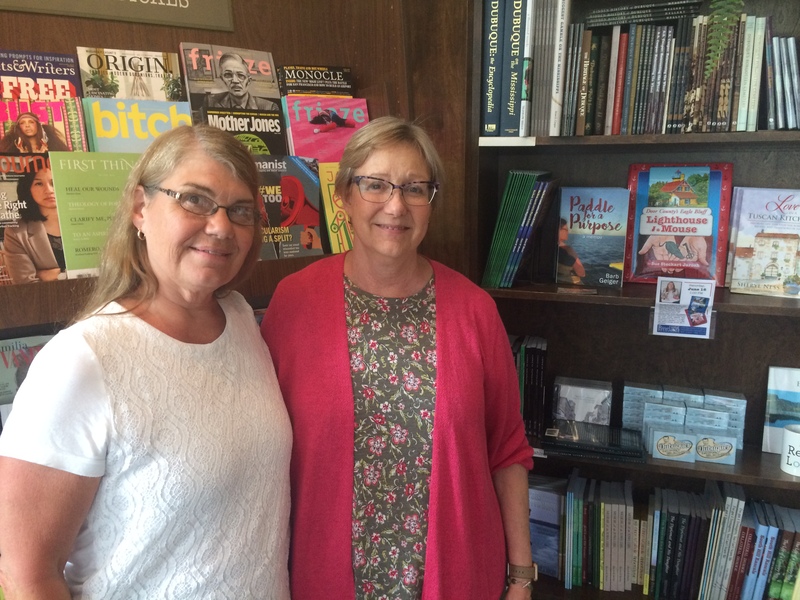 We also got a chance to meet Sue Davis, owner of River Lights Bookstore, who arranged for us to do a reading and signing while we were in Dubuque. Friends, new and old, attended to hear sections about our service with The Open Closet clothing ministry of St. John’s Church and about the day we spent on the river with the ever-ebullient Connie Roling. 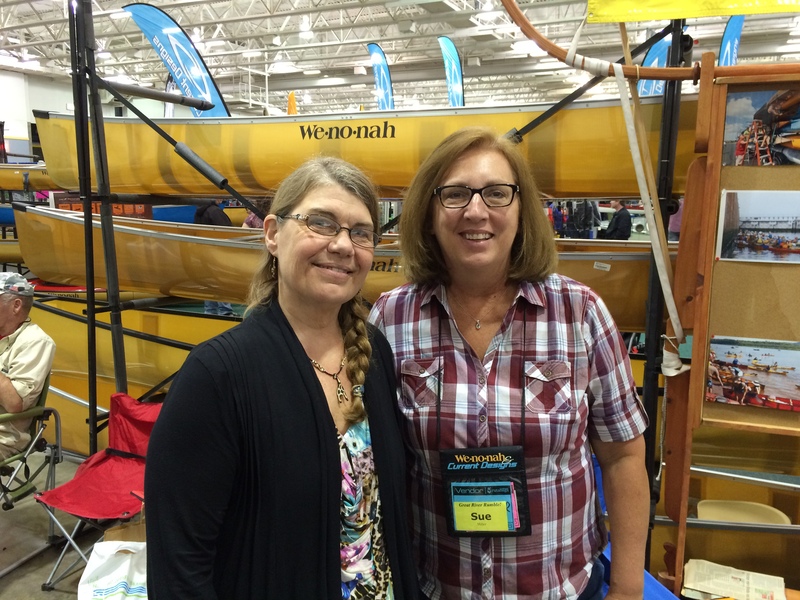 (You can read about Connie and her husband, Dave on pages 194-199 of Paddle for a Purpose!) 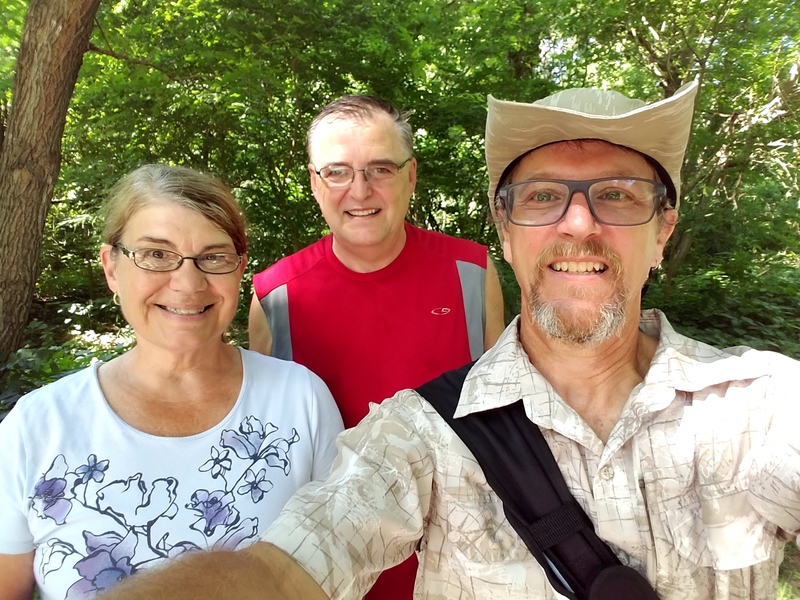 Connie brought several members of her family to listen, Paul and Carol, in the area from Waukesha, surprised us, and we even met some new friends who heard our interview. If you live in the Dubuque area, be sure to stop in and browse at River Lights. You’ll even find Paddle for a Purpose on the shelves! 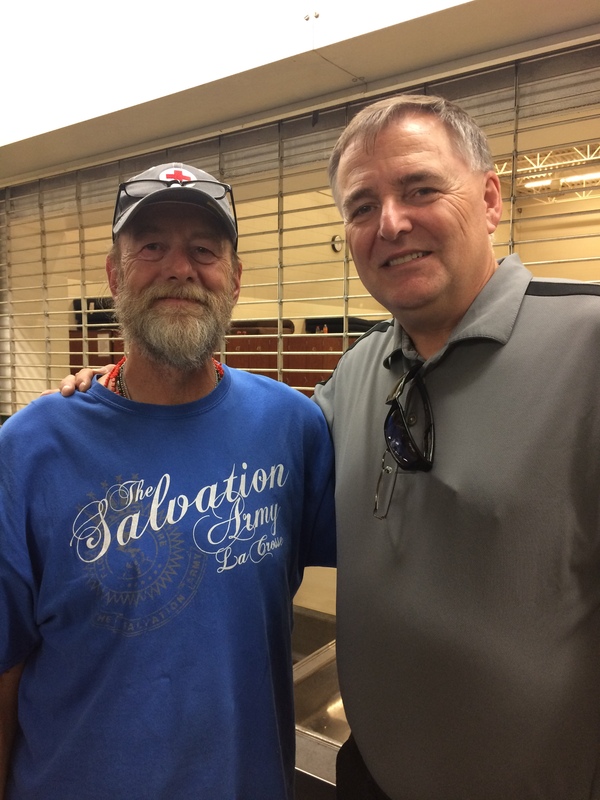 While in Dubuque, we reconnected with Pastor Jay Ilten and volunteered again with The Open Closet. We helped with preparations on Friday, and with Open Closet hours on Saturday, when over 330 customers came to choose free clothing while their children were invited to create painted frames for their silhouettes, drawn by an on-site artist. Ruth, the director of The Open Closet, and her husband, Richard, hosted a lovely dinner where we met even more people involved with the awesome ministries happening at St. John’s. * The Open Closet is available on special nights for women from the area women’s shelter, so clients who may have lived through trauma can feel safe. Only women volunteers assist during these times. Thank you, St. John’s, for your example, seeing the needs in your community and making connections which help make the greatest possible impact, serving those in need and accompanying them on a path toward independence. We can’t wait for our trip to northern Minnesota this July. If you want to schedule a book event, or just get together to say hi, we’ll look forward to seeing you! One of the most awesome things about living here in Waukesha is the support that I’ve found from area small businesses. When it comes to donating prizes for fundraising, space, time, and money, the businesses in this community never fail to come through. But during the past month, I have been especially grateful for the way that some of our favorite places have supported home town authors like me. 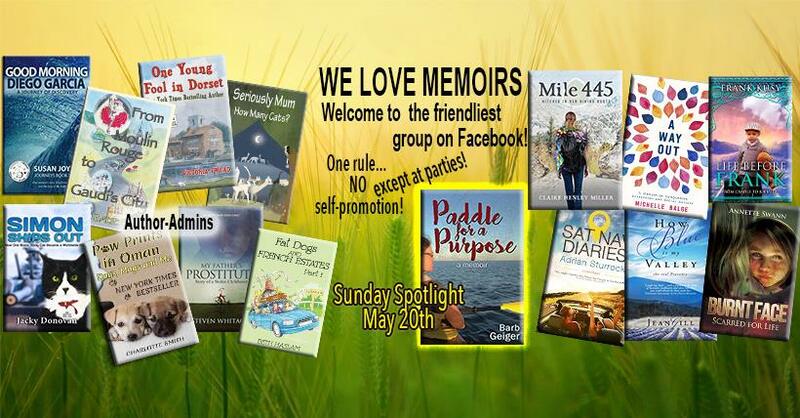 On April 27th, the Book Launch for Paddle for a Purpose was held at Le Caffe Bistro, located at S30W24896 Sunset Drive. We chose it partly because of the warm and cozy atmosphere, but also because it is where much of the book was written (and revised) from an armchair by the fireplace, a sugar-free mocha and a warm scone or fresh wrap by my side. The staff never failed to make me feel welcome, and continued this tradition when I inquired about having my Book Launch there. Sherri’s planning was meticulous, her staffing, baked goods and special drinks flawless. With a packed house, she saw to the details so that we could just enjoy our evening. 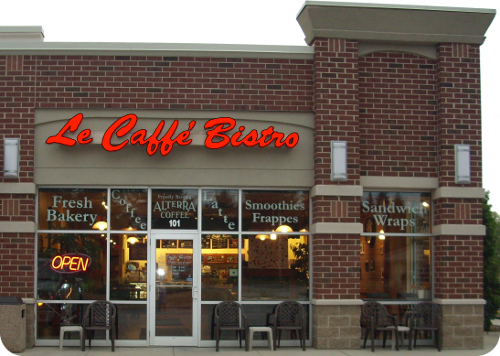 Thank you, Le Caffe Bistro, for your support! 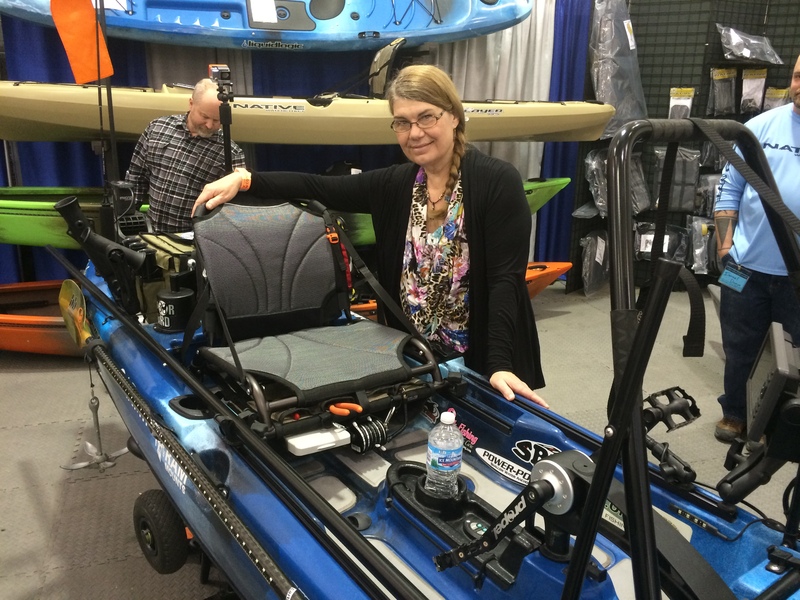 From the moment we told the owners of Martha Merrell’s Books, Norm and Eve Bruce, about Paddle for a Purpose, they were “on board” with the story of our service kayak adventure. Located at 231 W. Main Street, they became the first bookstore to order Paddle for a Purpose to display on their shelves. They offered to host readings and signings as well. A former second grade student, Kari, now a teacher herself! Less than a week after our launch, Martha Merrell’s held a book signing event for us during the Art Crawl. They took care of selling our books inside, so we could sit outside on a beautiful day, concentrating on greeting customers and signing books for readers. And at the end of the day, they even donated to the charities described in our book. Thank you, Norm and Eve, for your kindness and over-the-top generosity! 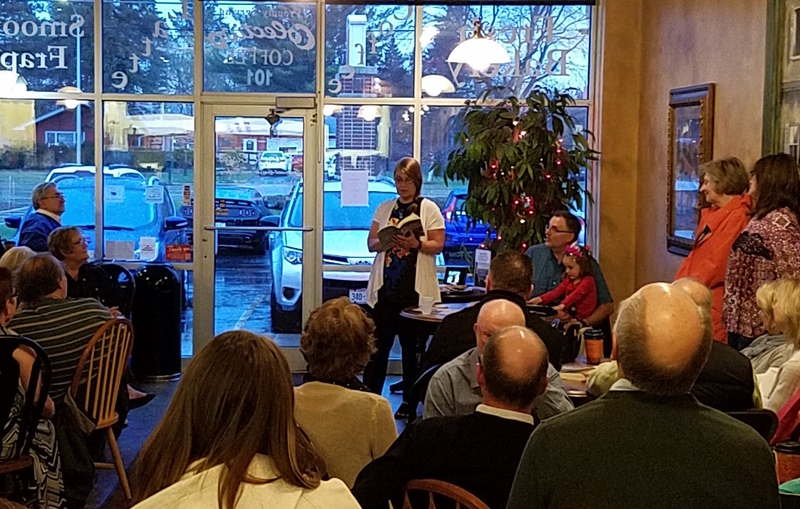 I can’t end without mentioning another excellent coffee shop that continually supports area authors – Cafe De Arts, located at 830 W. St. Paul Avenue. The atmosphere is creative, eclectic and friendly, and the staff is always welcoming. I’ve worked on my own writing there and attended many Book Launches for colleagues. They also host Friday Night Free-For-Alls several times a year, when the public is invited to hear students and staff of the AllWriters’ Workplace & Workshop, as well as a special guest author, read selections in a variety of genres. Thank you, Cafe De Arts! Do you have businesses in your towns that welcome and support authors? If so, I’d love to hear about them in the comments below. And, don’t forget to frequent their businesses and thank them for supporting your communities! New Page for Readers’ Photos! 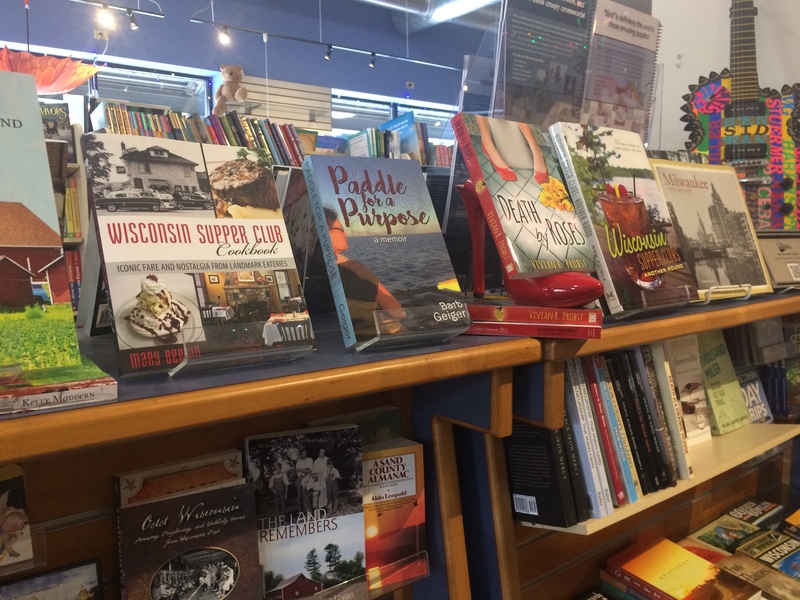 Now that Paddle for a Purpose has officially been released, we’re finding it popping up now and then – on social media, in messages, and even at my favorite hometown bookstore, keeping company with such books as Aldo Leopold’s A Sand County Almanac. As a first-time author, this is humbling, anxiety-producing and exciting, all at once. I hope the stories that inspired us during the river journey in our little wooden kayak, Kupendana, will be a source of encouragement to those of you who read them. It is with this mind that we decided to start a Readers’ Page on our website – a place where you can view each others’ photos, comments, and stories. We hope the page will be dynamic, growing and changing with new ideas related to service and/or travel. But we are starting with a photo gallery we call, “Paddle for a Purpose Sightings” You can find it on the main page, under the tab with the same name. If you would like your picture to be included on the page, just send me a photo of yourself with Paddle for a Purpose anywhere you happen to be. Include your name and location, and I’ll post it on the page for other readers to see. (You can send it to bgeiger1@gmail.com, or tag me on my Barbara Ann Geiger Facebook account.) Check in, every now and then, to see all the places we travel together! At the end of May, we’ll have a random drawing to choose two winners of gift certificates to my publisher’s website, http://www.electiopublishing.com. Good luck! Let’s see how far we can go!